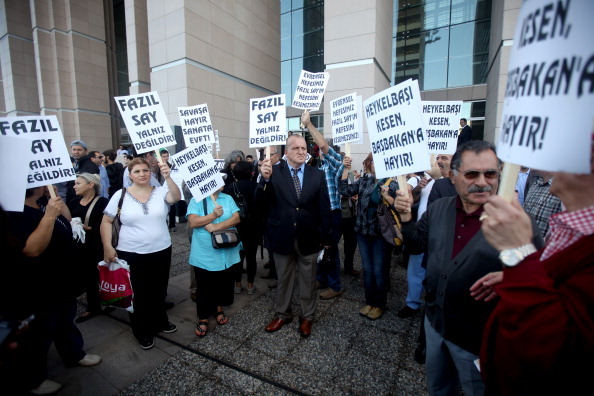 Supporters of Fazil Say, a world-renowned Turkish pianist who went before an Istanbul court on charges of insulting Islam and offending Muslims in comments he made on Twitter (Photo Credit: STR/AFP/Getty Images). 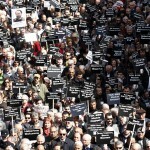 In Turkey, freedom of expression is under attack. But you can make a difference. And it will only take two minutes of your time to add your voice to calls for real freedom in Turkey. The situation is grave. Overly broad anti-terrorism laws have led to the prosecution of people for their ideas. An elderly grandmother has been convicted under terrorism charges for calling for peace between Turks and Kurds. Students, publishers, scholars and lawyers…all have been targeted under laws that confuse peaceful dissent for criminal violence. Moreover, Turkey has retained a series of laws that directly limit freedom of expression. In its most recent report, Amnesty International documents case after case in which Turkish authorities continue to attack individuals for peacefully expressing their ideas. The force of these laws ripple through Turkish society. There is a concerted effort to depoliticize universities. The arrest of scores of journalists has justifiably damaged Turkey’s international reputation. Turkey knows it has a freedom deficit. The Turkish government has been stung by bad press, by the on-going work of groups like Amnesty International, and by a series of embarrassing rulings against it in the European Court of Human Rights. This pressure has resulted in a series of judicial reforms aimed at improving Turkey’s human rights record. The most recent of these, the Fourth Judicial Package, was passed by the Turkish Parliament earlier this month. At the very last moment, in large part due to the hard work of Amnesty and other human rights organizations, the Turkish government amended the package to broaden its impact. We welcome these reforms. But the reality is that they simply do not go far enough. And even the Turkish government seems to know this. The ink was hardly dry on the Fourth Judicial Package, when Ali Babacan, the Deputy Prime Minister, began speaking of a Fifth and Sixth Judicial Package. As my dad told me growing up, it is important to do things right the first time. Indeed, Amnesty’s Freedom of Expression report says, “[In] practice, Article 216 has been used to prosecute criticism of dominant beliefs and power structures and…[not] to prosecute actual incitement to violence or discrimination against at-risk groups.” As if to highlight this point, Turkish language media sources report that a young man was recently sentenced to six months imprisonment for a Facebook post that was deemed as critical of the Prophet Muhammad. Particularly with Prime Minister Erdoğan’s planned visit to the Washington in mid-May, it is urgent that we lend our voices to the call for freedom of expression in Turkey. There will be much on the agenda. But, if enough of us join the call for freedom, we can ensure that human rights will not be forgotten. Sign the petition here. It will take only a couple of minutes. And then ask your friends and family to do the same. Together, we can make a difference. This entry was posted in Censorship and Free Speech, Europe, Prisoners and People at Risk and tagged amnesty international, Criminalization of Dissent, Facebook, Fazil Say, Fourth Judicial Package, human rights, Turkey, twitter by Howard Eissenstat. Bookmark the permalink. Mr Erdogan, Turkey used to be a free, democratic country. Why do you want to do of if a dictatorship under the muslim law? we are on the duty dear Maddelena Lombardi! thanks for your comment…he will never ever be allowed to change our country from a modern Republic to a dictatorship! thanks for your support!